How could the pro women produce a 2:18:47 course record this past Monday at the 118th Boston Marathon, while the equally powerful men only manage a 2:08:37, some five and a half minutes off the 2011 course record? Ah, the mysteries of racing. Which is why pure, non-paced competition is generally more compelling than time-trialing where everyone knows exactly what’s ahead. The only question is whether the time can be attained. If ever there was a case for competition over pacing, Boston 2014 tabs it. 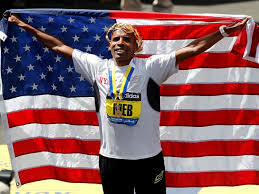 But let’s look deeper into the 2014 Boston Marathon, and explore how the tactics and personalities of each race contributed to the outcome that brought Meb Keflezighi to the finish as the first American male champion in 31 years, and saw Rita Jeptoo of Kenya bury the first sub-2:20 women’s performance in Boston history, while Buzu Deba joined her with a 2:19:59 in second place.